Volkswagen Super Bowl 2012 Ad Star Wars Controversy? Who Cares. The 2012 Volkswagen Super Bowl Ad was highly anticipated after the German car maker's huge hit in 2011 with The Force. Volkswagen kept the Star Wars theme and it looked like it will be a winner again when the company released the teaser for the Super Bowl Spot titled The Bark Side. The teaser got over 10 million views, but as reported before the initial success did not help the popularity of the actual 2012 Volkswagen Super Bowl Ad that is right now counting 3.1 million views. This number pales in comparison to the 12.5 million the Acura Super Bowl 2012 Ad with Jerry Seinfeld has now. 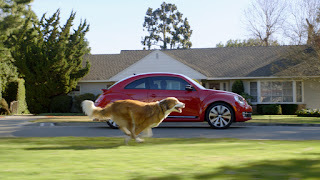 The reason why the Volkswagen Super Bowl 2012 Ad is not catching on is that the main part with the dog named Bolt is nice, but has not the special something the Darth Vader kid had. The short part at the end in the Star Wars cantina is entertaining, but not a must see. Still, the Star Wars references seem to push the buttons of Star Wars fans. Two editors at Wired posted stories arguing about weather the Star Wars scene is a Travesty or not. Ethan Gilsdorf says it is a travesty, because he thinks that it crosses the line to "remake a scene from a beloved movie — down to every eerie detail and character — and have those characters and scenes and places exist fully in the fantasy world — in this case, the cantina — in order to sell us a real-world product. A flipping car." His colleague Matt Blum posted a story later arguing that the Volkswagen Ad is not a travesty. He says: "This isn’t product placement, but rather an ad attempting to be memorable by making a clear and well-made reference to a famous scene from one of the most beloved films of all time. That it isn’t identical to the original scene is actually, in my opinion, a good thing — it keeps the memory of the original scene separate from the memory of the commercial." Matt Blum also concludes that the 2012 Volkswagen Ad is memorable. I disagree. This ad will not enter pop culture and will be forgotten soon. Heck, I even find this Chevy Super Bowl Ad better that runs in the Post-Game show.